Feature: The worlds most popular children's entertainment group The Wiggles return with a brand new collection of timeless tunes, The Wiggles Nursery Rhymes 2! Join Anthony, Emma, Lachy, and Simon, as they perform wonderful renditions of much-loved favourites including 'Hey, Didd... read full description below. 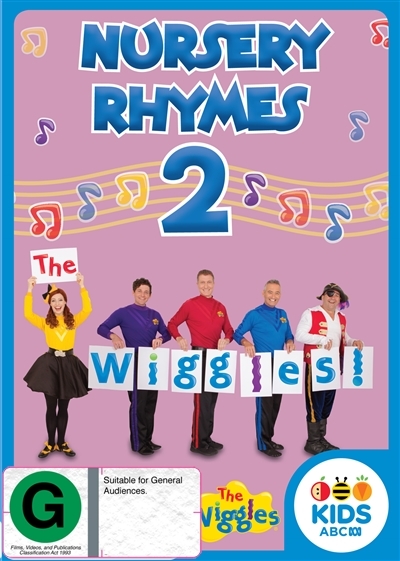 Feature: The worlds most popular children's entertainment group The Wiggles return with a brand new collection of timeless tunes, The Wiggles Nursery Rhymes 2! Join Anthony, Emma, Lachy, and Simon, as they perform wonderful renditions of much-loved favourites including 'Hey, Diddle, Diddle', 'Mary Had A Little Lamb' and 'Sailor Went To Sea'. Playing with words, sounds and pace heightens children's literary development. Throughout this fun-filled and engaging set of songs, The Wiggles use rhyme and rhythm, both critical aspects of language, which greatly facilitate children's success in learning to read. Children learn best through play and we hope The Wiggles Nursery Rhymes 2 will encourage children to sing, dance, play and tell stories inspired by these great versions.